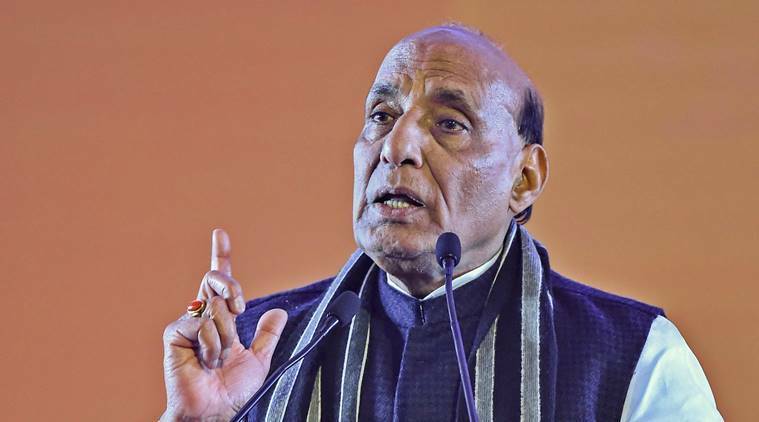 Union Home Minister Rajnath Singh Tuesday said if then Prime Minister Indira Gandhi can be praised for splitting Pakistan into two in 1971, why can’t incumbent Narendra Modi be applauded for giving a befitting reply to Islamabad for the Pulwama terror attack. Addressing a well-attended public meeting at Nehru Maidan here, he ridiculed the Congress for questioning the air strike on a terror camp at Balakot in Pakistan and over the issue of number of terrorists killed in the operation. The former BJP president said the February 26 air strike led to restlessness in Pakistan which is understandable, but sought to know why the same feeling prevailed in some sections in India. “When terrorists attacked and killed our 42 soldiers in Pulwama, Prime Minister Modi immediately held a meeting and ordered the armed forces to avenge the attack within 15 days. “The operation was executed with utmost care on the 13th day (of Pulwama attack), taking precaution that no innocent person or the Pakistan army is targeted. We targeted only the terrorist training centre and destroyed it,” he said. “If Pakistan turned restless after this attack that is natural, but why should there be restlessness in some sections in the country?” he asked.